Though I made my living as a freelance writer for much of my adult life, I wasn’t terribly ambitious. It was my day job, that’s the way I looked at it. I did a lot of different things, but the bulk of the stuff was for trade magazines or newsletters. It didn’t pay very well (especially because I don’t write very fast), but it was flexible. On the lower rungs of freelance writing (in those days,) you could make 25 cents to 35 cents a word. Like many jobs, it now pays less then it did 10 or 20 years ago. Rates at the lower end have plummeted to a few cents a word, or even less – no pay, but they give you “exposure.” You can expose how well you write about floorwaxing or whatever. That kind of reminds me of when people wanted me to work as a movie extra for free, and told me I’d be seen all over the world (as an extra) , but that’s another story. Anyway, right after I had some arm trouble (radial tunnel syndrome) my writing got even slower, because I was using voice software, which didn’t work very well in those days. So I thought maybe I would aim a little higher – at consumer publications (which paid better, usually around a dollar a word) and write less, and then try to pick up the slack from bartending, which was something I had done many years before. Shortly after I made this decision, I heard a crowd of people directly across the street from the window of my home office shouting: “Don’t offend her, because she’s transgender!” and similar slogans. I went downstairs and found the future President of the City Council of New York City, Christine Quinn (then a civil rights lawyer) and an associate leading a protest along with Vickie Ramos who was the offended transgender person. Vickie had been brutally harassed by some of the (female) nurses at the nursing home across the street, because of her past life as a guy. The whole story was quite complicated and astounding and Vickie had the proof to back things up, which she eventually did in a court of law. (I’ll explain it all in a future post). But anyway, Vickie was more than happy to get her story told. So it seemed like opportunity had struck and I started shopping the piece through cold calls, etc. I got a taker in Brooklyn Bridge magazine, a new publication that was meant to be sort of a New York Magazine for Brooklyn. Then halfway in, they pulled the plug on the story for fear of offending the nurse’s union which was a heavy advertiser (in preparation for a strike against Long Island College Hospital.). As a consolation, they gave me an assignment to do a story about the popularity of Brooklyn Bridge chewing gum. My mind reeled at the tradeoff, but a job is a job. I worked like hell on the piece and though it may read like a fable, nothing at all is made up. Although, in typical American style, I was unfair to the French. I wasn’t too happy with the editing and later when I did the story at a reading, I revised it. That’s the version below. It’s not as interesting as Vickie’s life, but It’s one of my favorite work for hire pieces, and probably the best story about Brooklyn Bridge chewing gum one is likely to come across, until freelance wages go up and someone else can put in the time that I did. Did you growing up in Italy, chewing away, ever think about Brooklyn? I didn’t want to ruin Anna’s wedding by informing her that that was scarcely possible. According to modern marketing theory an evocative name is the single most important factor in drawing consumers to a product. Thus no brand could have achieved the popularity of Brooklyn Bridge gum in Italy without a name rich in imagery and connotation. At least that’s what my editor at Brooklyn Bridge Magazine was convinced of. My assignment was to find out what that imagery was. What was it about Brooklyn that had such a powerful appeal to Italians? And parenthetically, why didn’t that appeal carry over to neighboring France. Shortly thereafter, there were a series of incidents that were even more offensive to the linguistically-sensitive French. This happened, in a classic case of the road to hell is paved with good intentions, when Brooklyn’s Topps Bubble Gum sought to address the perennially poor foreign language skills of our nation’s youth. “What are you going to do when you get as big as your father? Que feras-tu plus tard quand tu seras aussi grand comme ton Papa? Needless to say, Topps’ efforts had no noticeable effect on French literacy in the US and the effort was abandoned after a year, or so. But the damage had already been done. Given this history of conflict, it’s not surprising that as far as France is concerned the name ‘Brooklyn’ equals mud and their gum passion is reserved for Hollywood Chewing Gum. Brooklyn can only take solace in the fact that it wasn’t once again beaten out by its bete noir across the river. And how nice it would be to leave old Gotham out of the story altogether. But there’s no getting around the fact that Adam’s New York Chewing Gum, patented in 1871, was the first urban-identified chewing gum. That’s indisputable, because it’s also the first chewing gum as we know it, i.e. made out of chicle. Prior to that point chewing gum was made out of dried spruce sap, or paraffin. In fact, for all intents and purposes it was dried spruce sap or paraffin. Or to put it another way — Ick! But luckily, just like that Touched by an Angel TV show, some higher fate intervened in human form and saved future generations from wretched gum experiences. Wearing the halo this time was General Santa Anna, of Alamo fame — or infamy, if you like — who inexplicably (a fondness for ferries?) was living in political exile on Staten Island. The former dictator of Mexico was hoping to finance a return to power by selling chicle, a sticky substance extracted from the Central American sapodilla tree. His theory was that it could be processed into a rubber substitute. After meeting with Santa Anna, that’s just what Thomas Adams, a Staten Island-based inventor struggled to do. And ultimately failed at. But then Adams exploited the very property that had led to his failure — he couldn’t get the chicle to harden — by creating New York Chewing Gum, a huge success that launched a new industry and changed the course of chewing forever. 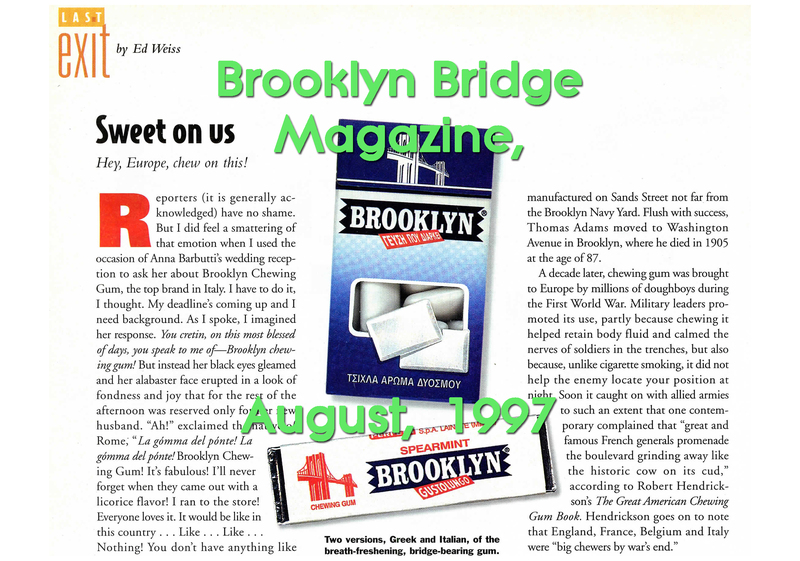 In its heyday in late 1880s, New York Chewing Gum was manufactured in (where else) Brooklyn! On Sands Street not far from The Navy Yard. Thomas Adams himself moved to Washington avenue in Brooklyn where he died in 1903 at the age of 87. But never in the course of that long life did it occur to him to name a gum after his adopted borough. Which just goes to show you that: even a genius at invention can be a complete dunderhead when it comes to naming gum. For New York Chewing Gum vanished into obscurity after the Adams plant left Sands Street, while Brooklyn chewing gum is still going strong today. Which brings us back to Italy. I called embassies, I called tourist offices, I called historical societies… I got bubkus! Voicemail hell, let me transfer your call to the twilight zone, etc. etc. And I don’t blame them. Who wants to go on the record with some jerk inquiring about the existential properties of chewing gum? But there’s one thing you learn in the freelance journalism biz, never, ever, give up. Because if you do, you’ll never , ever, get paid. Finally, at long last, I got somebody at the Italian Trade Commission to go on the record with me. This is how our conversation went. After reflecting that the distance between my window and the pavement below was not far enough for a quick and painless death, I decided to give it one last shot. If live sources wouldn’t yield results, it was time to hit the books. I went to the Brooklyn Library (main branch) and dug deeper into Brooklyn, and gum, history. I discovered that it wasn’t until the advent of World War 1 that chewing gum crossed the ocean with U.S. troops and became popular in Europe. So much so, that “England, France, Belgium, and Italy were… big chewers by war’ s end, ” according to Robert Hendrickson’ s The Great American Chewing Gum Book. Was it that simple? “Did Brooklyn, [the US destination of 500,000+ Italians], simply come to symbolize America,?” I asked Anna before she took off on her honeymoon.